The Punisher is back, baby! 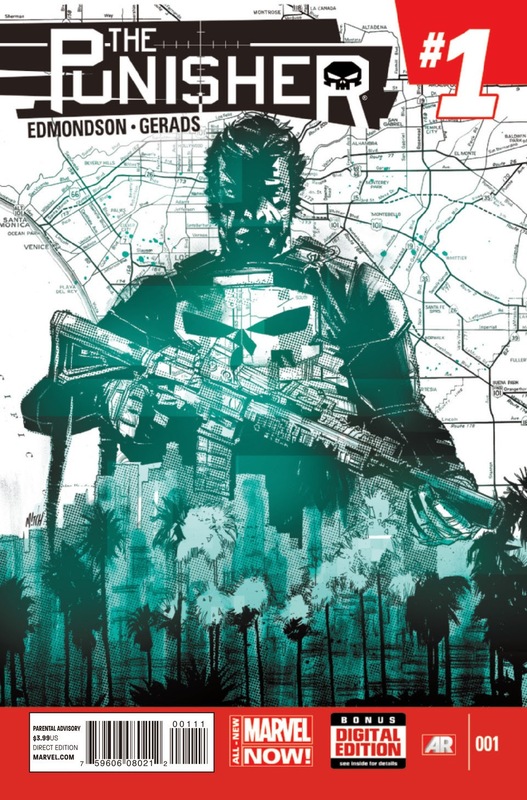 Frank Castle has returned to the Marvel U in his All New Marvel NOW! title and boy I couldn't be happier. I love what Greg Rucka did with the character and I was very sad to see it go. So you know I was more than ecstatic to hear it was coming back. Let's see if Edmondson can match up to Punisher writer's past. We open up in Togo, near the Ghana border. A hostage situation. Lights go dim and some soldier folk break in, taking the hostage away. We can only assume these guys are good. The chopper flies away and that's the end of that. A very confusing way to start a book, but I'm sure it'll tie in eventually. Now we're in Mexico, where Frankie boy is doing some light swimming. An explosion here, some gunshots there, and our protagonist has his target right up front. The next couple panels are typical Punisher and I love it. Where are the drugs going? I don't know, I just drop them off. To who? I don't know? Aaaaaaand pressure. Except this pressure is on the trigger of a gun and some fingers are lost. Franks gets his answers and it looks like he's headed to LA. Los Angeles. The city of Angels. Whatever else you wanna call it. It doesn't take long for Frank to make friends with who he needs to make friends with. Local diner chef, some local cops but more importantly, insiders that'll give him the weaponry that he needs. With all that in place, Frank begins his first job of LA. Some year gas and a traffic jam later, Frank's got a ton of questions and his target to answer them, a man named Hector. He spills to Frank where the drugs are going, and Franks solution is simple. It involves a rocket launcher, and that's all I'm saying. This issue ends on a confusing note. A team always thought to be good is coming together to bring in the Punisher. Are they a new team naming themselves after the good guys, or have these guys gone bad? This book was great, I'm so glad to see one of my favorite heroes back in the game. He's Marvel's Batman...except cooler cuse he kills. YEAH I SAID IT!!! I liked everything about this book. The writing set itself up for a great story and was surprisingly funny for a Punisher book. The art was a tad bit bland, but acceptable. Can't wait for the next one! Until next time readers!